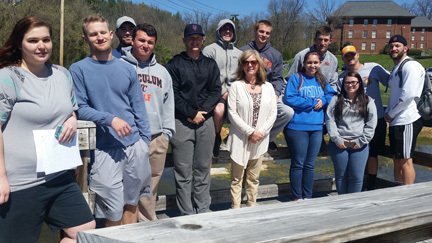 On Tuesday, April 5, 2016, three service-learning students from Tusculum College conducted a student-led wetland tour of the Paul E. Hayden Educational Wetland on the Greeneville campus, under the direction of the Middle Nolichucky Watershed Alliance. Samantha Cochran, Chris Hutson, and Preston Tucker provided attendees with information on stormwater wetlands, history of the on-campus wetland, as well as facts about the importance of wetlands in protecting water quality. All three students are juniors, with Cochran majoring in psychology and Hutson and tucker majoring in business. Stormwater wetlands function to filter nutrients and pollutants from nearby runoff, with the Paul E. Hayden Educational Wetland draining runoff from the campus before it is deposited into College Creek, running alongside the wetland area. College Creek is on the Environmental Protection Agency’s 303d list of impaired streams and is one of 58 impaired streams in Greene County. MNWA appreciates all the effort put in by Tusculum students in protecting our watershed. For information on scheduling a tour of the Paul E. Hayden Educational Wetland, please contact Appalachia CARES AmeriCorps Member Kristen Lane at mnwa.tn@gmail.com. Tusculum students learn from leading Wetlands tour.